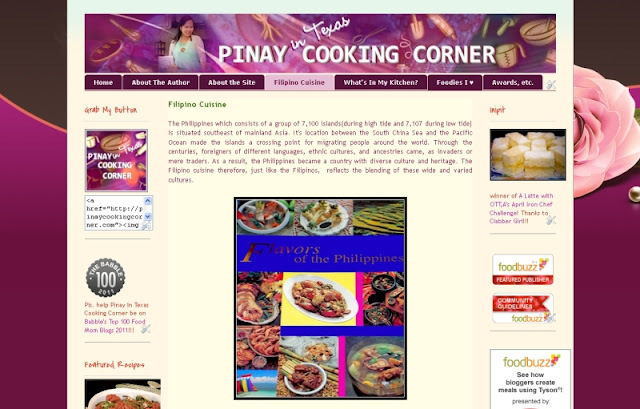 When I thought of creating Pinay In Texas Cooking Corner in January, I really didn't have the chance to give my page background and blog header much consideration. I love roses so when I saw the rose background on blogger, I decided to use it and adapt its color for my blog header and fonts as well. I simply wanted my header to be something related to cooking, with my picture on it to make it more personalized (LOL), so that's how I designed it, and my blog came out with this look. Today, I'm saying goodbye to my old header and background as I try to make Pinay In Texas Cooking Corner a better reflection of myself - A Filipina (Pinay) who's loving her life in Texas but will always be proud of where she came from! My new header shows both the Philippine and Texas flags which now makes it more descriptive of my chosen blogging alias "Pinay in Texas". I still haven't decided on the background that best suits my blog...but for the meantime, I'm using this vector waves background with a mixture of blue and green which are both my favorite colors. 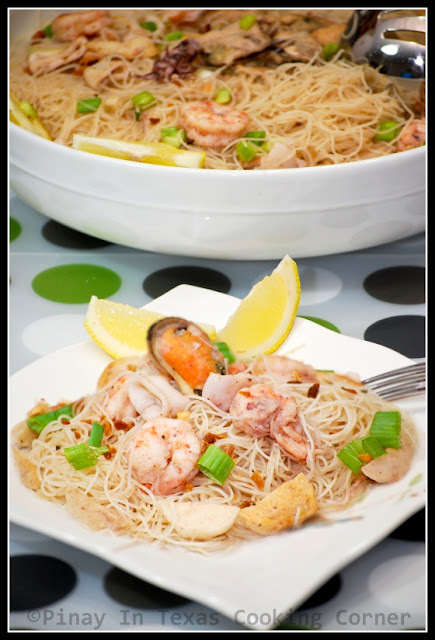 Today, I'm sharing with you another "pancit" recipe. 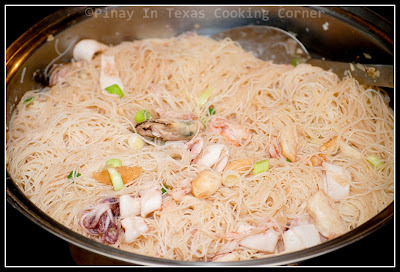 Pancit is the term for noodles in Filipino Cuisine. 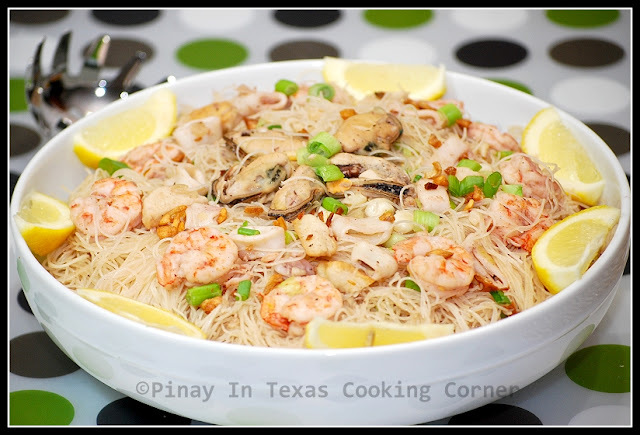 I've featured other pancit recipes before like the Pancit Canton & Pancit Palabok. This time, it's Pancit Bihon Guisado which like the Pancit Palabok makes use of bihon or rice noodles. The difference between them lies in the cooking method and the special sauce used to top Pancit Palabok. 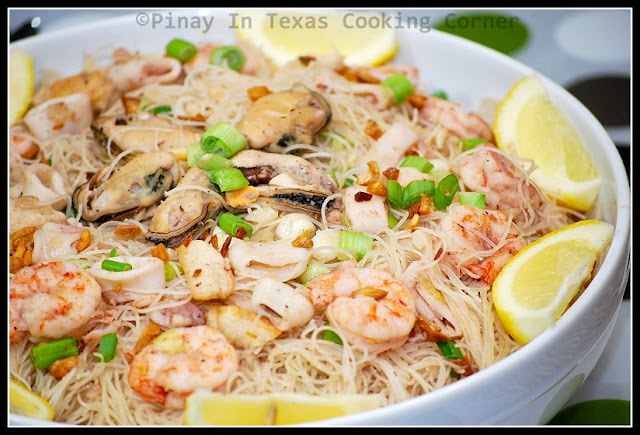 Pancit Bihon is simply sauteed with vegetables, meat or seafood and flavored with soy sauce, fish sauce and broth. Like the Pancit Canton, it is very flexible that you can add whatever ingredients you want. Whether you add in plain meat, vegetables or seafood or all of it, it will still be good. This Pancit Bihon Guisado that I'm going to share with you is my seafood version, and I just used fish sauce and shrimp broth to give it a real seafood flavor. I also didn't use vegetables which I usually do with my pancit. In this one, I just used more garlic for added flavor and green onions to give it a hint of green color. *I'm sharing this on Food Trip Friday, Foodie Friday, Fat Camp Friday, Friday Potluck@EKat's Kitchen and Feed Me Tweet Me Follow Me Home. 1. In a wok over medium heat, fry squid balls in 3 Tbsp olive oil until light brown. Remove from wok and set aside. 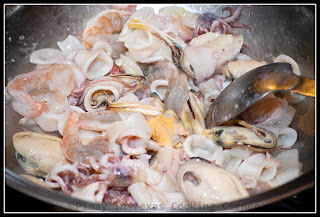 Sauté shrimp, mussels and squid just until the shrimps turn pink. Remove from wok and set aside. 2. In the same wok, add remaining 1 Tbsp olive oil. 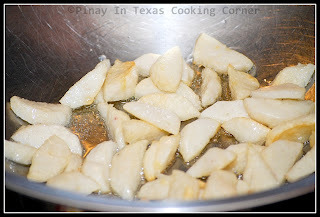 Saute onion and garlic until garlic is golden brown. 3. Pour in broth and add fish sauce. Bring to a boil. 4. Add noodles and keep on tossing to loosen the noodles. Add salt and pepper to suit your taste. Cook until noodles are almost soft. 5. 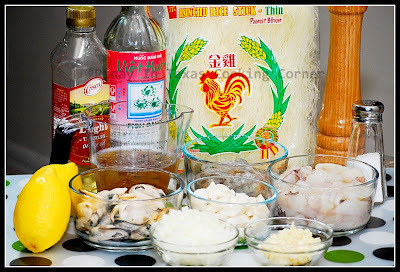 Add green onions and cooked shrimps, mussels, squid and squid balls. 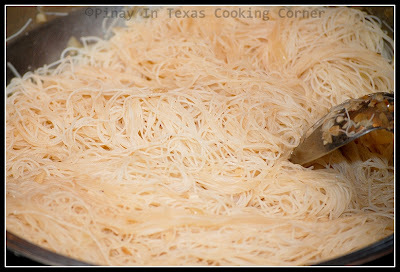 Keep on tossing until ingredients are well mixed and noodles are soft. Do not overcook. 6. Remove from heat. Transfer to a serving platter and sprinkle/garnish with lemon. I like the new look... the page is clear and easy to read! Love the incorporation of your flag with your state flag too! Ooh! This looks so good! :) Thanks for sharing, Tin! Looks so good! I like the new banner with the home flag and Texas state. Welcome and Thanks for joining us. I love your Bihon Guisado because I saw you put lots of Shrimp,my most favorite! LOL Rachel! It's of course a lot better compared to Lucky Me...but I always have Lucky Me Pancit Canton in my pantry just in case I get too lazy to cook. @Sarah & Adora: Thanks! I'm glad you like it! I love your new header - it is so pretty. Always remain true to yourself, that's what makes your blog so fun to read. I love your recipe -as usual you have presented your end product so nicely. Have a great weekend Tina. Looks like a sumptuous meal! YUMMY!! love eating pancit to. Love the new look! I do love all pancits esp with a good sambal belacan (Shrimp paste chilli). Auguri per la nuova "casa". I love your new header. You really out a lot of thoughts into it. I love that. 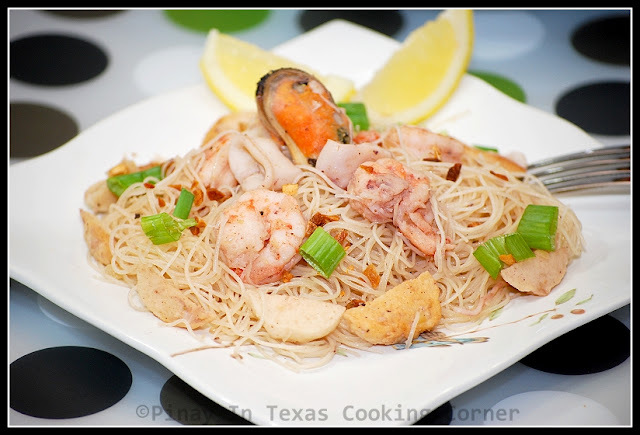 This Seafood Pancit looks mouthwatering and delicious! Can't wait to cook some over the weekend! :) Thanks for sharing and have a wonderful weekend. Your pancit guisado has a tons of delicious sahog, my goodness. I like the new header Tina; it's says more about your site. The new banner is great and this meal looks incredible. Thanks for sharing this at Fat Camp Friday this weekend. Enjoy your weekend, see you next week! Hi, I am from Malaysia and it's my first time visiting your blog. I have visited Cebu and Manila and I love to learn some Phillipines dishes, e.g. Adobo, which I love a lot. Looking forward to seeing more recipes from you. Btw, it's great that you also have a picture of the ingredients used. That helps a lot for us to familiarize with the ingredients for the recipe! Selamat! love your site's new look tina! siguro pwede ka din design ng mga websites eh! :) as usual, love your recipes..hoping i could cook as good as you. ryan and your girls are so lucky! hope to see you one time..
your pancit is so beautiful!